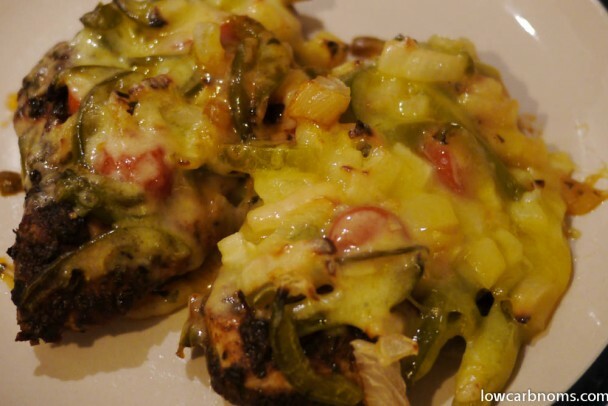 This is another excellent recipe that we found on Linda’s Low Carb Recipes. It’s quite hot in flavour, but the cheese keeps it from being too much (you can also serve it with sour cream if you want to). It’s simple to make and it is definitely one of our favourites. It also looks really good – like something you might be served in a restaurant. Stir together the first 7 ingredients in a medium bowl (it will be a thick paste). Add the chicken and rub the seasoning mixture all over the meat until coated evenly. Place the chicken on a foil-lined baking sheet. Arrange the vegetables over the chicken. Bake for 20 minutes or until the chicken is just done. Do not overcook. Top with the cheese and return to oven until melted, about 5 minutes. Serve (you can add sour cream for serving if you like).